Acknowledging that he has very little say in who is cast or what characters join the show, Stephen Amell still managed during his Wizard World Chicago panel this afternoon to give fans quite a bit to chew on in terms of the possibility of future tie-ins with DC's biggest-name superheroes. 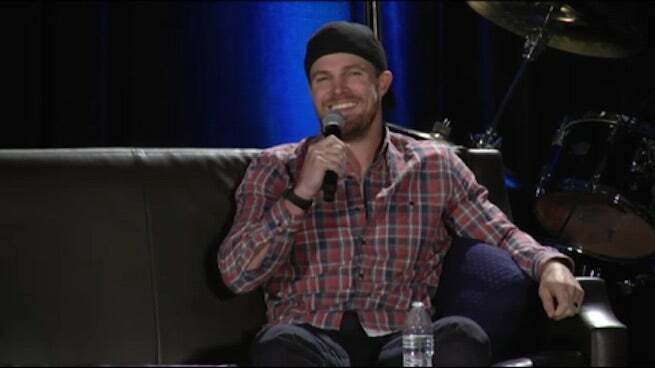 During a Q&A session with fans, Amell acknowledged that he would still love to get Bruce Wayne on the series at some point, saying that a character so similar to Oliver Queen in so many ways could make a great ally, or even a great rival. That said, Amell told fans that he'd discussed the issue with DC Entertainment chief Diane Nelson, who told him that they want to keep exclusivity and separation between big properties to make "the best version of each thing," and not run the risk of forcing unnecessary crossovers. "So it's going to be tough to bring [those characters] to the show," Amell admitted. Still, Amell said, using that logic he doesn't see any reason why Arrow couldn't have "their version" of Bruce Wayne down the line -- presumably a mindset shared with at least some people involved with the series since The Flash referred to Wayne Enterprises in its pilot. Asked further whether the door is completely closed on the idea of Amell playing Oliver Queen in a DC movie, the actor was cautious. While there is "no contractual barrier to me appearing in a...DC movie," Amell admitted, if the opportunity ever arose he would have to consider whether it was something he really wanted. "I'm very proud of this universe we've built with Arrow and The Flash and now Legends of Tomorrow," Amell said, joking, "...I don't know if Supergirl is in our universe. Who knows?" Can’t make it to Wizard World's Chicago Comic Con this weekend? No worries, as ComicBook.com and ConTV are bringing the show straight to you. Want to try ConTV out? You can do so for FREE by clicking here! If you love it, and want to be sure to catch all the excitement coming out of Wizard World Chicago, there is a special offer for ComicBook.com readers who sign up for ConTV VIP. We have a special 15% off code (SHERA1) that you can use when clicking here. Arrow returns on October 7 at 8 p.m. ET/PT on The CW and airs every Wednesday night in that timeslot.